so my old blender that I had for decades finally died and I got a nice new one. I have kale in the garden getting huge. I haven't done anything with it so far, while I've been focusing on keeping up with the swiss chard. I know about using kale as a green in soups, stir fries, etc. But any one have a good kale smoothie recipe they like (kale and fruits or veggies or both) that TASTES good as well as is nutritious? I keep hearing about how healthy they are, but it always sounds pretty strange to me. Frozen fruit bananas, grapes, watermelon, orange, papaya, berries, mango, pineapple, peaches, whatever you have. Add to blender and blend until smooth. Serve immediately. Very high in fiber so don't drink more than one glass. applestar wrote: Today's smoothie was so balanced in flavors that none stood out -- not sweet, not tart/sour, not salty, not bitter.... But strangely so delicious that my DD stood up and poured herself a 2nd glass as soon as she finished her 1st, then spooned out the clinging remains... DH stopped by while out for lunch so I gave him a small portion in a yellow and blue glass to hide its color, and he downed it saying it was delicious (very unusual)... I nearly finished my own 2nd serving before remembering to pause and take a picture. Big pile of torn Lacinato kale leaves, ribs removed, enough rice milk to cover, blended smooth with freshly squeezed lemon juice and some sea salt, then added maple syrup and a frozen overripe banana, whole milk greek yogurt, 1/2 perfectly ripe avocado. When blended smooth, it turned out very thick (like custard) so added some bottled spring water and blended to a pourable consistency. BTW, I gave a kale rib to one of the cats as a joke and she munched it up , so I put a few more in their food dish. The 2nd kitty came along and two of them chewed and crunched and ate them all up. Funny cats...I think 2nd DD has been forgetting to give them their vitamins. Yep looks like Red Russian Kale which I've been letting go to seed and they self seed everywhere. Very good eating. Young leaves are good for salads and older bigger leaves for kale chips and sneaking into smoothies for the kids to drink their veggies. They particularly liked Banana, Kale, Kiwi combo. Recently, DD said, you added kale didn't you? The smoothie wasn't this green -- it was more like pale yellow -- when I saw it last, then I walked away and now it looks greener! But they loved it anyway. This one was banana, mango, and avocado + kale. Large bunch of Lacinato/Toscana kale fresh picked from the garden, no bottom stems. Blend smooth into green milk. Add 1 frozen overripe banana, and fair slosh of unfiltered apple juice, blend. I gave DH his in a small 6 oz glass since its was only his 2nd time drinking one of my green kale smoothies -- my girls and I got ours in 8 oz and 12 oz glasses twice and 1/2 serving more -- DH actually asked for 2nd serving, then when I asked who wants to finish it, he was the first one to raise his empty glass for a third serving. Pour in glasses, then pour/drizzle Wegmsn's organic plain kefir to taste -- we each added quite a lot. DH -- remember this is a man who doesn't like eating leafy green vegetables -- "Mmmm... SO GOOD!" ...he drank about 16 oz all by himself. applestar wrote: I like smoothies and veg juice when I'm sick, too. I've been feeling the summer heat stress. I made a Korean cold buckwheat noodles the other day. 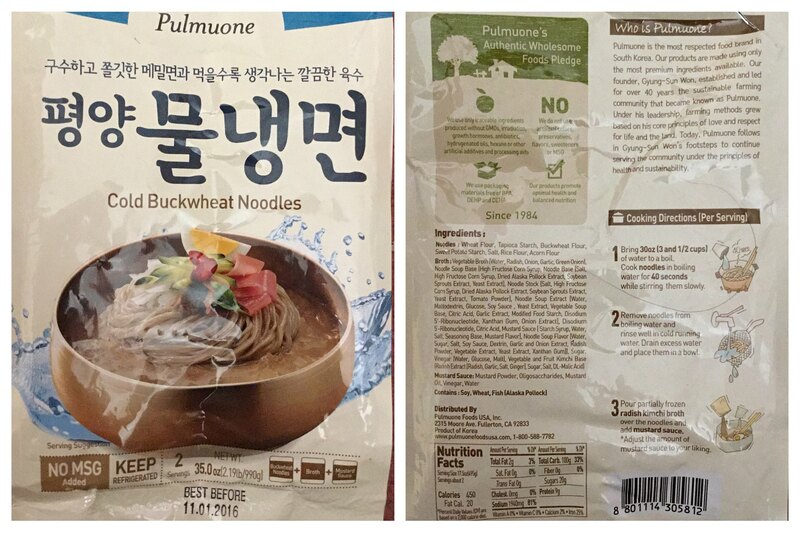 It comes in a package with 2 servings of thin fresh noodles and 2 bags of "radish broth" I was trying it for the first time and had no idea what to expect, so ate 1st serving as is. 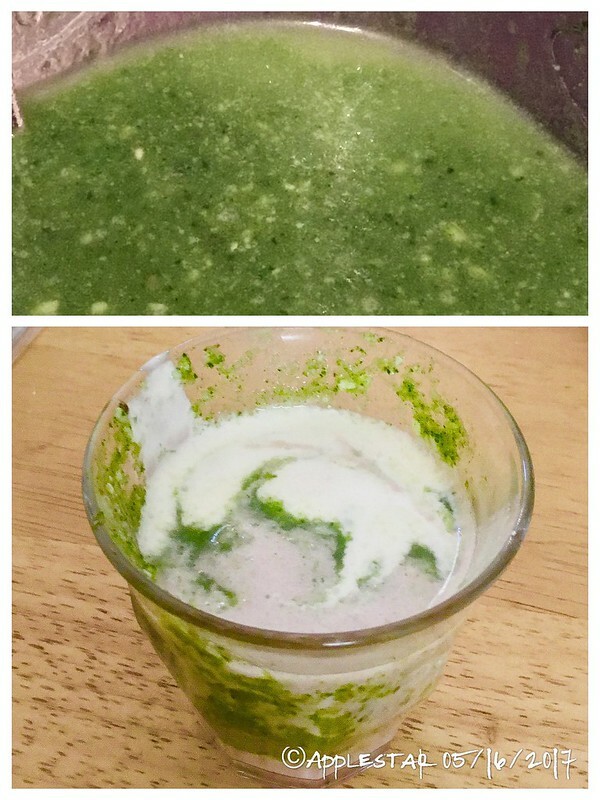 Yesterday, I made the second serving by blending several huge leaves of Bok Choi, kale, radish and broccoli with the packaged broth into very dark green smoothie, then pouring over the cooked chilled noodles. Torn up nori on top as garnish. Very very green and yummy. @Imafan what's this caution about not having more than one glass? 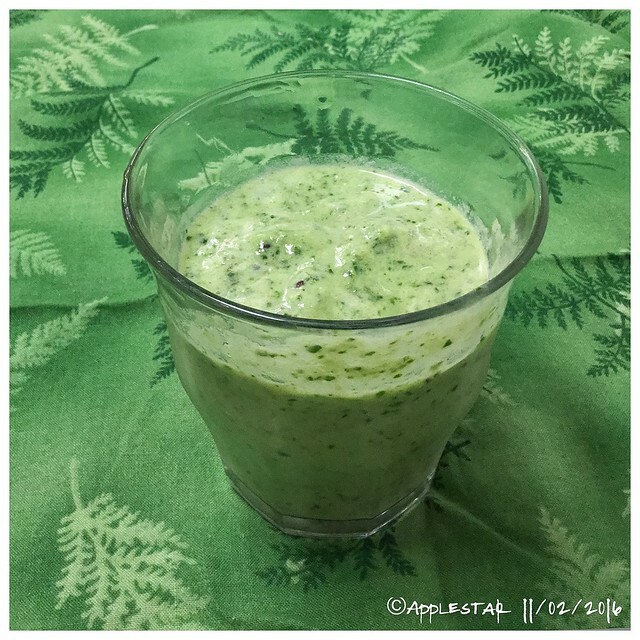 Reading over my kale smoothie posts, it looks like we all had more than one glass, even my DH! Well, it was a laxative for me with all that fiber. BTW I learned early on that if you add red things, the Kale-based smoothie turns an unattractive brown-ish color. At that point, you might as well add molasses and cocoa and make it a chocolate smoothie. I guess I should have looked it up myself, but thanks very much everybody! Definitely will try some of them. Most of them talk about freezing the kale first. Is that important? Scroll down to the picture of the purple & green smoothie. Ooh so poured in layers -- need two machines (or pitchers).... avoids the muddy mixing of colors... hmmm. Yes, the layered look for smoothies is more appetizing than brown smoothies. I like that they make smoothies in the garden. That's about as fresh as you can get. If you ever see some of their exercise routines, you'd be amazed. They live a very healthy lifestyle. Hiking, smoothies, mangoes, Costa Rica retreats, etc. OK so I made my first ever kale smoothie: 5 large kale leaves destemmed, one frozen banana, some peaches, some greek yoghurt, some soy milk. But after blending it a long time in my brand new blender that even has a button labeled "green smoothie," it was still all full of little leaf flakes. Is it supposed to be able to blend it smooth? I did not freeze the kale, since some of applestar's recipes said garden fresh. If I had frozen it, would that help it blend smooth? Taste wasn't bad. Not quite what I would call delicious, but definitely drinkable. But I don't find all the little leaf pieces in my drink to make a very pleasant drinking experience. I think frozen kale leave definitely start out more tender. Kale leaves go limp pretty easily in a salad as soon as they are hit with dressing though, so you might start by covering with the liquid first and giving it 5 minutes or so? I think that's what I did. You could also try adding ice cubes from the beginning to help beat them up more. Another option might be to strain them out with medium strainer and use the strained bits in something else -- omelet or breakfast muffin/pancakes maybe? Kale is supposed to be less bitter if it is frozen before eating. But we put everything in the blender frozen so the temperature won't drop in processing and have the smoothie melt down too soon. A drink blender, blends at a different speed than a regular blender. My regular blender can't really chop ice well. The smoothie blender like the ninja bullet not only whips through ice without a problem, it also blends smooth fairly quickly. My Vitamix makes great smoothies, even grinding up nuts and seeds in the smoothies. Here's something I have found out: even in the VM, if the smoothie is too liquidy then some things just bounce off of the blades, and won't totally grind everything up, even on the high speed. So be sure to make them very thick, at first, then add any water or juice. Pieces of ice will also bounce around like that, if not enough is put in to thicken it. Vitamix is on my future kitchen upgrade wish list. My cheap blender does not make smooth smoothies. My smoothies tend to be "chewable"